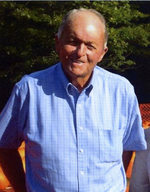 Clifton C. Harben, 84, of Dawsonville passed away Friday January 8, 2016 following a sudden illness. Born March 18, 1931 to the late Grady and Ida Harben, he was a lifelong resident of Dawson County. A heavy equipment operator, Clifton was employed by Dawson County for over 20 years and also worked at other locations. He enjoyed gardening and being on his tractor. Being very devoted to his family, he enjoyed spending time with all of them. Mr. Harben was a member of Juno Baptist Church and was also preceded in death by a sister, Beatrice Vaughters; and brothers, Herbert Harben, Warren Harben, Havard Harben and Roy Harben. Surviving are his wife of 62 years, Ruby Harben, Dawsonville; sons and daughter in law, Terry Harben, Jeffrey and Janice Harben, both of Dawsonville; grandchildren, Adam Harben, Alana and Josh Hill, Amber Lee, Marla Lee; great grandchildren, Ava Harben, Baylor Hill; sister, Aline Burt, Dawsonville; brother and sister in law, Gary and Gail Harben, Dawsonville; sisters in law, Arlene Swafford, Maude Harben, Irene Harben, all of Dawsonville; and a number of other relatives. Funeral services will be held Monday January 11, 2016 at 2 o’clock at Juno Baptist Church. Rev. Brody Hughes, Rev. Leonard W. Ridings and Rev. Dennis Bottoms will officiate. Interment will follow in the church cemetery. The family will receive friends Sunday from 1 until 8 at the funeral home.